We’ve always had a good relationship with Shoeboxed. It’s no wonder, really, considering we have so much in common: Efficiency, style, a deep hatred of loose pieces of paper. Our partnership has been going so well, we decided it was time to take things to the next level. Shoeboxed and Skyclerk has seriously committed to each other. To celebrate this joyous occasion, we wanted to share the love. If you don’t have a Skyclerk account, just register one and we’ll do the rest, from setting you up with Shoeboxed to linking the two accounts together. 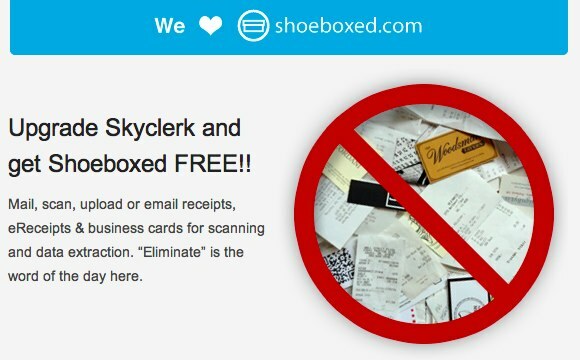 If you already have a Skyclerk account, all you need to do is activate Shoeboxed. If you already have a Shoeboxed account, we’ll transfer it over to Skyclerk. Don’t worry; we’ll pick up the tab so you only have one monthly bill. Like any strong relationship, this one is based on a seamless give-and-take. When you have both accounts activated, your Shoeboxed transactions will be automatically imported to your Skyclerk account every day. How sweet is that? Waltz on over to Skyclerk to get started. Ain’t love grand?